Posted on February 14, 2016 by Al B. 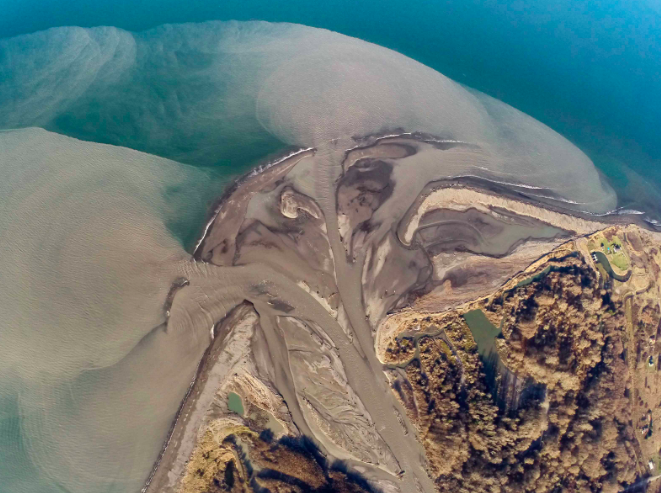 Great aerial photography of the new Elwha river and a wonderful story with illustrations. While the jury is still out on the long term viability of the returning salmon runs, it does appear, at this early point, that the project is a success. But we won’t know for sure for probably at least 30 years. In the meantime, enjoy the view, and give thanks to the Lower Elwha Tribe, and the individuals and politicians of both parties here on the Peninsula that supported this effort, funded it, and are helping to restore it. The whole world is really watching this one. ELWHA RIVER — The Elwha watershed is booming with new life, after the world’s largest dam removal. The first concrete went flying in September 2011, and Elwha Dam was out the following March. Glines Canyon Dam upriver tumbled for good in September 2014. Today the river roars through the tight rock canyon once plugged by Elwha Dam, and surges past the bald, rocky hill where the powerhouse stood. The hum of the generators is replaced by the river singing in full voice, shrugging off a century of confinement like it never happened. Nature’s resurgence is visible everywhere. Posted on November 9, 2015 by Al B. Posted on February 18, 2015 by Al B. Posted on January 19, 2015 by Al B. The work continues on the Great Healing of the Elwha. Posted on January 2, 2015 by Al B. The Peninsula Daily News covers the changes happening to the Elwha. The recent storms have washed massive amounts of sediment down the river, as planned. The article doesn’t mention that this late December storm, with the record temperatures we are having, means that snowpack will not be as low as it once was. This adds to the volume of water coming down the river, which in pre-industrial days would have been trapped in snow and more slowly released in the spring. Worth a read if you follow the Elwha story. Posted on November 14, 2014 by Al B. These guys are doing some very interesting new technology. Check them out. This morning Flying FishViews Inc. (F2V) released an innovative approach for interacting with rivers,coasts and shores, demonstrated by the first-ever panoramic tour of Washington State’s Elwha River. F2V is a Seattle-based tech startup that spent the last 18 months developing technology to capture FishViews, a fresh way to tell the story of our rivers, coasts and shores. This new approach enables users to view and navigate within panoramic, river-level imagery. FishViews are captured thru HD photography on, over and under the water, and fused with concurrent measurements of the physical properties of the waterway – all synchronized by time and location. FishViews provide users with a rich, immersive browsing experience that enables greater understanding of a specific location or area. “Like many new, revolutionary data products, once it is available people will recognize the remaining data gaps even more – driving demand for more extensive coverage with this product.” John Mickett, PhD Senior Oceanographer, University of Washington Applied Physics Lab. Dam removal began on the Elwha River in mid-September 2011. Today, the Elwha Dam is gone, all of Glines Canyon Dam has been removed, and the Lake Mills and Lake Aldwell reservoirs have drained. The Elwha River now flows freely from its headwaters in the Olympic Mountains to the Strait of Juan de Fuca for the first time in 100 years. The dam removal process was completed in late August of this year and F2V was there to capture the state of the river two days after the last dam came down. Thru Elwha River FishViews, users can virtually float and snorkel the river, and with F2V-collected data and call outs to important physical and biological features on the river, users can check out conditions before visiting the river – and even zoom in on important features. Prior to being dammed in the early 20th century, the Elwha River was home to some of the largest Chinook salmon in the northern hemisphere. During F2V’s Elwha data collection, Chinook salmon were imaged spawning in the Elwha above the dams for the first time in over 100 years. F2V aims to assist in the monitoring and assessment of the Elwha recovery to benefit scientific research, natural resource management, conservation, recreation and education. Looking to the future, F2V intends to work with Elwha River stakeholders to catalogue the recovery process and extend the project further upriver, eventually capturing the entire 45 miles from source to sea. San Marcos River and Lady Bird Lake.